Acu-Tech offers cost-effective piping solutions with the strength, durability and corrosion resistance necessary for all your plumbing and drainage pipeline requirements. 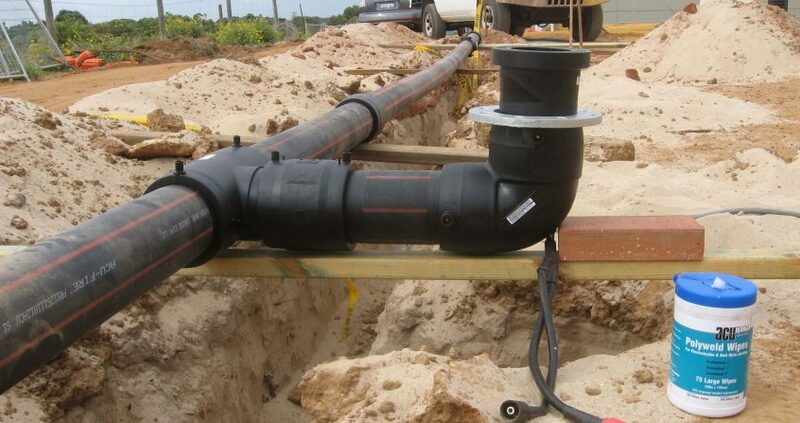 Acu-Tech Piping Systems manufactures Polyethylene drainage pipe in W.A. Drainage pipe can be pressure pipe or non-pressure pipe, depending on the application. Drainage pipe is plain black on the outside, and has a thin wall compared to pressure pipe, as the contents are not under much pressure. HDPE drainage pipe may also be known as Polyethylene Flood Pipe, which is large diameter drainage pipe for storm-water or high-volume drainage applications. Acu-Tech’s drainage pipe, known as Acu-Drain Pipe System, can be welded with drainage electrofusion fittings, which are different from pressure-pipe electrofusion fittings. Pressure pipe for Water, Gas, Fire mains, recycled water, or other purposes, have stripes on the side to indicate the fluid or gas they contain. Acu-Water has a blue stripe and is used for potable water. Acu-Fire has a red stripe and carries water for fire mains. Acu-Gas has a yellow stripe or a yellow jacket, and is used for gas mains. Recycle-Tech has a purple stripe, and is used for recycled water. Acu-Black is plain black, and can be used for storm-water or general applications. While Acu-Black may look like Acu-Drain, you will notice that Acu-Black always has a thicker pipe wall, because it is made to withstand higher pressures. Applications for drainage pipe in commercial plumbing include shopping centres, schools, hospitals, aged care facilities, university or health campuses, warehouse complexes and office buildings. Heat-fused jointing systems create a monolithic structure that is stronger than the pipe itself, and completely leak-free. This eliminates rubber seals which can fail over time, also solving root intrusion problems, and provides pipeline integrity where installed in unstable ground. No dangerous chemicals or glues involved in jointing. No anchor or thrust blocks needed (joints are fully end load resistant). Pressure pipes are colour coded for easy identification. High flow capacity due to smooth bore and end-to-end jointing. Large range of pipe sizes and fittings available, providing flexibility of design. High quality approved products, designed and manufactured to exacting Australian and International standards. At Acu-Tech, we recognise that our customers need the whole package -not just pipe and fittings; but also personal service, technical support, training and on-time deliveries.